Technically, the beginning of fall isn’t until September 23rd, so we still have a little bit of time to hurry, hurry, hurry and grab our last gasp of summer. 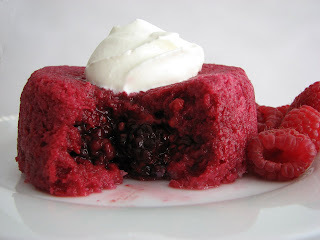 Here comes Summer Pudding, a British dessert that springs from the year 1902. It was originally served in English health resorts where pastry was forbidden. Wait, forbidden pastry? How very perfect. Dessert doesn’t really get much easier than this. Line a mold with slices of pan de mie or a bread that is similarly sturdy. The bread you select will need to hold its shape when doused with fresh ripe berries that have been warmed with a bit of sugar just enough to bring out their juicy goodness. I chose to do individual servings, but vary the presentation as you like. Seize this opportunity to celebrate that turn of the century as well as the turn of the season. Cheerio, summer. - Pan de mie is a bread that has a bit of butter, milk and sugar in the dough, producing a lovely mellow flavor and a very tight uniform crumb. It’s also known as a Pullman loaf in America. If you can’t locate pan de mie, try to find a plain loaf that is delicious yet sturdy enough to hold up and encase the juicy berries and will not compete for flavor. - Red currants are a very typical ingredient of Summer Pudding but can be very hard to find. If you want to bring that same element of tartness to the recipe, you can substitute a spoonful of red currant jelly. - You can liven up your Summer Pudding with a bit of framboise, a raspberry liqueur, or cassis, a black currant liqueur. Or try your favorite fruity zinfandel, port or a good quality kirsch. Gently warm the berries and sugar in a stainless steel saucepan. Cook until the berries start to break down and release their juices, but do not completely stew the fruit. You want some berries to hold their shape. Remove fruit from heat and stir in lemon juice or any additional flavoring. Slice the crusts from the bread and cut into sizes that will fit your mold. Line a 1 1/2-quart soufflé dish, bowl or ramekins with plastic wrap. Line the sides and bottom with bread until the inside surface of the mold has a layer of bread one slice thick. Fill in any open spaces with bread trimmings, making sure you have no gaps. Keep in mind this will be the surface of your pudding once the mold is inverted. Pour half of the berries into your mold, distributing half the juices over all. Layer more bread slices over the berries, using trimmings as necessary. (If you’re making individual ramekins, you may not have room for a middle layer of bread.) Add the last of the remaining berries and juices. Finish with a final layer of bread that covers the entire surface of the pudding. Lay a piece of plastic wrap on top of the pudding. Set a plate with a slightly smaller diameter on top and place a moderately heavy weight (like a canned good or a ceramic bowl) on the plate to compact the pudding. Refrigerate overnight to give the mixture time to soak through and firm up. When ready to serve, whip the cream. When it starts to thicken, add the sugar and vanilla and continue to beat just until it forms soft peaks. Remove the top layer of plastic wrap from the pudding and invert onto a serving plate. (Depending on the amount of residual juice, you may want to choose a serving plate with a rim.) Carefully lift off the mold and plastic wrap. Serve with whipped cream. And what could express luxe better than those fragile and fleeting berries. How lovely and simple the concept, how utterly beautiful your presentation and photos. Cheerio, summer, indeed. Thanks so much, Pastry Chef! As an expat I make several of these throughout the season. Essential to any summer menu! That and Pimms. Cheers! What an incredibly simple and great end of season berry bash. Thank you for the background, the lovely photos and the recipe. I think you should turn your photographs into fine art prints and sell them. I can practically taste them! Gorgeous and delicious.